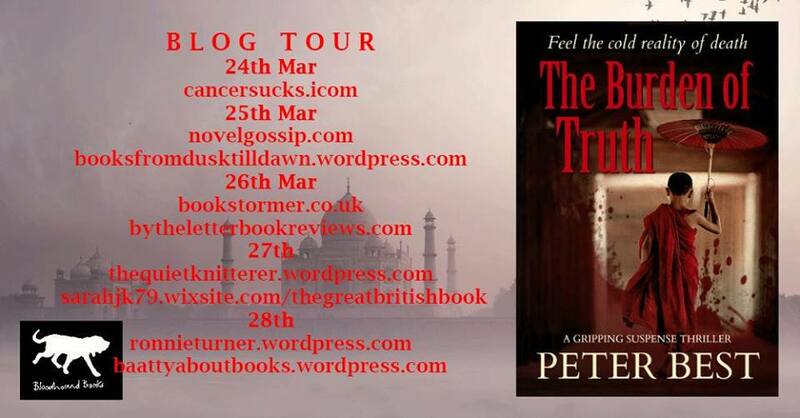 Meanwhile in Bodhgaya India, Peter Canon has just made a discovery that will change his life forever. Now like Brent, he must come to terms with his very own guilty secret of the past. But little does he know the woman he loves is slowly hunting him down. And when she finds him; questions are asked! The tale of The Burden of Truth is the first instalment of a three-part saga of how these two men are pulled apart and then drawn together as each man tries to fulfill his own quest for happiness. But they are soon to find out this quest is thwart with love as well as danger. I was compelled to buy this book, it kept popping up everywhere, even when I was reading another book, this was the book one of the characters was reading. I didn’t know what it was about but I knew I had to find out. What a tremendous journey Peter Best has taken me on! There are so many fascinating stories being told and you wonder how they will all come together but they do brilliantly. If you could imagine standing at the side of a lake with a hand full of pebbles and throwing them in, each one makes a ripple and those ripples connect with each other directly or indirectly. that is like the characters in the book. The characters feel so real and there are some pretty nasty ones amongst them. Buddhism plays a major role in the story with the obvious extensive research into this being very evident. The story is very intriguing following the life of Brent after a near death experience. The novel has a great pace and the writing style is brilliant. Each individual story is fascinating but when they all come together it has that wow factor. This is a very thought provoking story that has you assessing your own life and wondering what impact you have made on other people’s lives and them on you. It is a book I will read again and again and feel that each time I will get something new from it. A great story you won’t forget. brilliant.